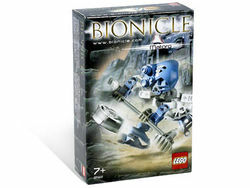 8582 Matoro is a BIONICLE set released in 2003, as one of the six Matoran released that year. Like the rest of those Matoran, he comes with a Kolhii Stick and a Kolhii Ball. Turning an axle on his back makes the torso swing, via gears. This is a description taken from LEGO.com. Please do not modify it. (see an archive of the product's page) Clever villager of Ko-Koro! Matoro has one of the most important jobs of any Matoran -- he must interpret the stories told by Turaga Nuju so all can benefit from the village elder's wisdom. Set includes koli stick and koli ball. Turning the gear on his back will cause his arms to swing left and right.